A dam at the north end of the lake controls the water level of the lake. The dam was constructed in 1850 and was deeded to the Watchic Lake Association by Central Maine Power in 1956. It is currently owned and managed by the Watchic Lake Dam LLC. Regular maintenance of the dam is provided by the WLA Dam Committee and WLA membership fees and donations. To address seasonal changes, the dam gate is opened to lower the water level on about October 15 (generally Columbus Day), and is closed again to raise the water level shortly after ice-out (between mid-April and early-May). 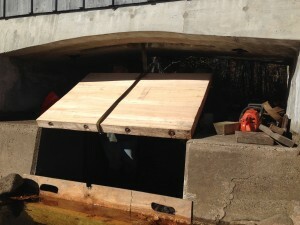 This helps avoid shore damage from winter ice and protect loon nests in the spring. The water level will generally lower/higher by about 18 inches over a two week period following the opening/closing of the dam gate. Between about May to October, volunteers check the water level at different locations on the lake. 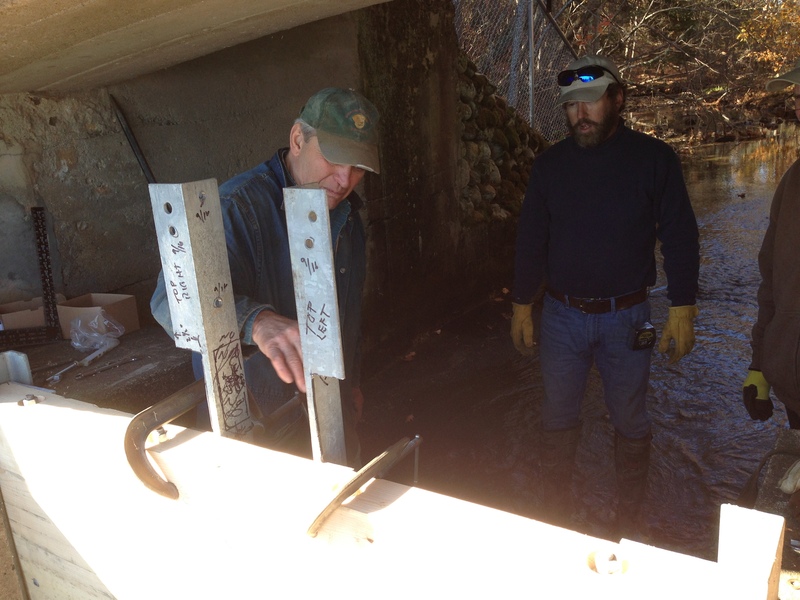 These volunteers will adjust the dam gate when they see water level approaching about 3 inches over full pond. For example, should we receive significant rainfall over a short period, the dam gate will be opened for enough time to bring the water level closer about 2 inches over full pond, allowing a cushion for dry spells and evaporation. Thanks to contributions for WLA members and others, the dam was completely rebuilt in 2010 after nearly 90 years of use. In late 2013 new safety measures were put in place. The design of this new dam has improved the flowage out of the lake, and generally kept the lake within an inch or two of full pond (in fact the lake has not been more than 3 inches above full pond since the new dam gate was installed). When the dam was rebuilt and modified, the capacity of the dam to spill water above full pond without manually opening the gate was increased by 400%. This reduced the number of times the gate needs to be manually opened and closed to maintain water level during the summer months by 75%. Check this website for updates on dam opening and closing dates. The dam functioned flawlessly for another year. The dam gate was closed April 12, 2017 just before ice out to raise the lake to the summer full pond level. Full pond was reached in about two weeks. The gate was opened ten times during the summer to maintain the lake level within plus or minus three inches of full pond. The highest level for the summer was plus 2.5 inches above full pond to minus 0.5 inches. The dam gate was opened to position one on October 9 to slowly lower the level for the winter. The gate was fully opened for the winter on October 31, a little early due to the storm. All of the operational goals for the year were meet, spring water level brought up early for nesting loons, level maintained within plus or minus 3 inches of full pond, and a continuous water flow from lake for the downstream ecosystem. 1. The dam gate is opened to position one to slowly lower the lake water level for the winter on Columbus Day. 2. When the lake level has been lowered the dam gate is then fully opened for the winter on about the first or second week of November. 3. The dam gate is closed to raise the lake for the summer on or just before ice out. 4. The history of the dam is available on the Watchic Lake Association web site. 5. The dam is operated and maintained by the Watchic Lake Association dam committee. After over thirty years, it was time to replace the gate on our dam. Two WLA volunteers, David Bradbury and David Ross, guided the installation of a new gate late in October. This new gate was built by David Bradbury and Donal Drew from hemlock farmed and milled on David’s property. David Ross fabricated the various fittings needed to secure and operate the gate. 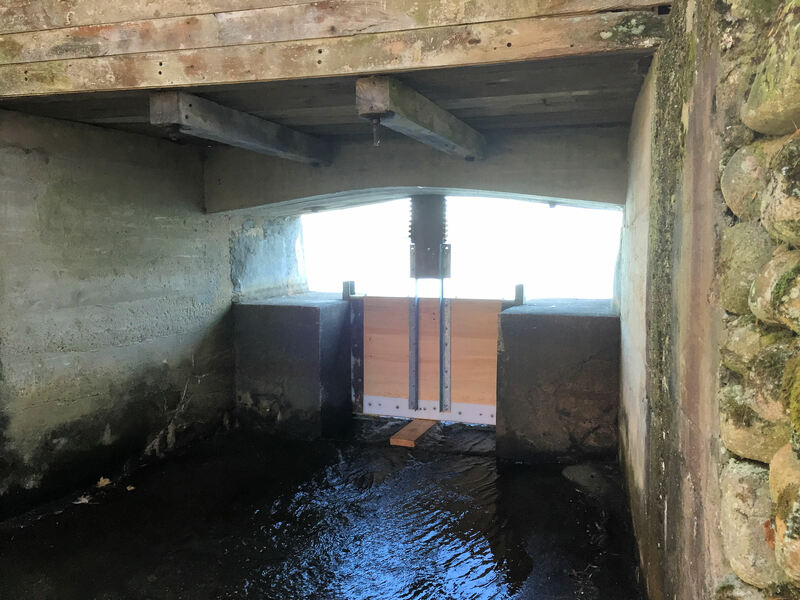 This new gate should make for a more consistent water level, be easier to operate…and last at least another thirty years! New gate about ready. 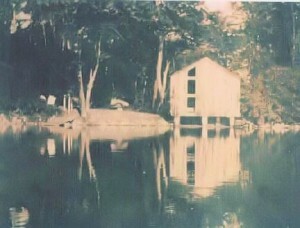 From behind the dam.